With exceptional facilities and modern amenities, this villa offers elegant accommodation to up to 15 people. The villa has an exceptional outdoor area, with a 12x6m infinity pool and a Jacuzzi. There is also a large covered terrace with dining facilities, comfortable lounges and a fully equipped BBQ area, ideal for spending the hot summer days as well as the beautiful evenings, under the starry sky. With an amazing view to the endless blue sea meeting the horizon, Nada Beachfront villa will provide the excellent setting for your summer holidays. The villa’s interior is modernly decorated with primarily white and earthly tones and colorful touches, creating a welcoming atmosphere. Entering the main door you walk in an open plan living room and kitchen area. The living room is equipped with a comfortable sitting area, a large flat screen smart TV, opening to a large furnished veranda with an excellent sea view. The kitchen is fully equipped and it has an oven, fridge and freezer, as well as a dish washer. On the ground floor there is a fully air conditioned bedroom with a double bed featuring an en-suite bathroom. The ground floor also has an extra bathroom with shower. Going up the stairs you enter the bedroom chambers where you can find 2 fully air conditioned bedrooms. The first has a double bed and a private balcony. The second bedroom has a double bed and an adjoining room with a single bed. Both bedrooms feature en-suite bathrooms. The villa has three more bedrooms downstairs. The first is equipped with bunk beds, while the second has bunk beds and a sofa, making them ideal for families with many children. There is also a third bedroom with bunk beds. 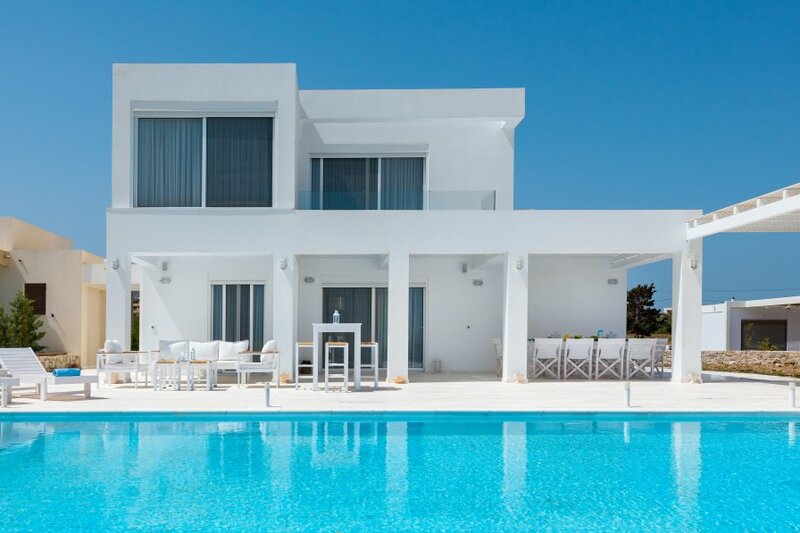 This modern villa also offers a range of amenities such as smart controls for lights and window shutters, Wi-Fi coverage throughout the property, washing machine, dishwasher, oven, microwave, deep freezer, satellite channels, DVD player, baby bed & high chair, iron and ironing board and clothes rack. The resort of Kolymbia, where the villa is located, offers excellent sea front tavernas, cafeterias, supermarkets, souvenir shops as well as exciting nightlife venues. During daytime visitors can enjoy a variety of water sports at the beach, boat trips and other summer activities. Maria beachfront villa is also an ideal base for those looking to make the most of their time on the island by visiting places of historical importance, cultural significance and natural beauty. Lindos and its’ famous ancient Greek Acropolis is only 30 minutes away by car. Rhodes town and the medieval city, a UNESCO monument of cultural heritage, is only 25km from the villa. 7 springs, or “Epta Piges” as it is commonly called, is a unique place of natural beauty and a wild life reserve can be reached by car within 15 minutes.